The DIR-615 provides an improved wireless signal for your network than the existing wireless 802.11g technology. Upgrading to Wireless N provides an excellent solution for sharing an Internet connection between computers and makes transfer of files like video, music, photos, and documents a leisurely delight. The DIR-615 router delivers great wireless performance, network security and coverage, and is ideal for upgrading your existing wireless home network. The DIR-615 might not be very aesthetically pleasing, but it still has loads of features. It has a black plastic body with white interface around the edges. It is 19.3 cm long, 11.68 cm wide, just 3 cm thick, and weighs about 334 grams. Looking like a slim plastic slab, it comprises a draft 2.0 802.11n wireless access point and has a quartet of switched Fast Ethernet ports at the backside. It can also be mounted on the wall. For an ordinary consumer device, the DIR-615 802.11 draft-N router has loads of nice features to boast about. The router supports standard WEP (64 and 128-bit encryption) and WPA/WPA2 wireless encryption. 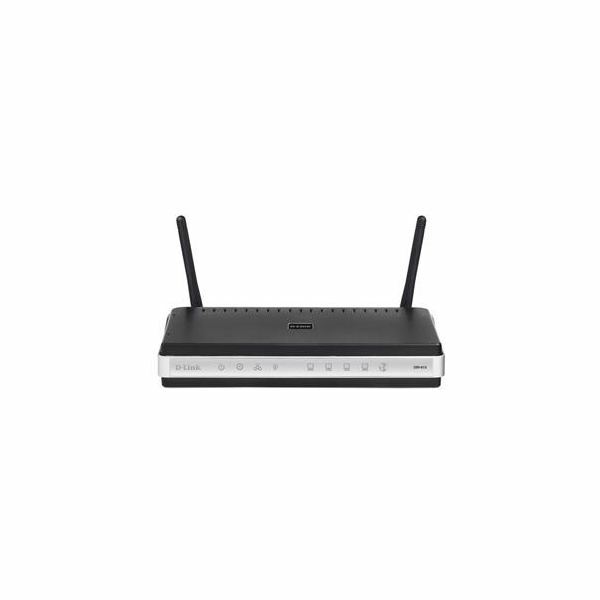 In addition to WPS (Wi-Fi Protected Setup) configuration feature which, when activated, can connect to any D-link wireless device and configure it with the click of a button, it can be connected to the Internet using static, DHCP, PPTP and PPPoe options. A driver CD comes in the package. Configuring the router for WAN access is very simple with the setup wizard on the CD. Features common to all routers include MAC address cloning, port forwarding, MAC address filter, SPI (stateful packet inspection), NAT (network address translation), and remote management. A nice feature is the option to configure and save all internal settings before rebooting the router. Compared to other routers without this feature, the DIR-615 is much easier to configure. The ability to monitor the router using the internal logging feature also places it a step ahead. You can configure it to send the logged reports through an SMTP gateway to a specific email address at a scheduled time/date or even when the logs are full. Another nice characteristic of DIR-615 is that it automatically searches for firmware updates and notifies the administrator via email. The wireless signal strength can also be tuned to one’s personal needs through the setup interface to avoid signal leaks and abuse by people beyond your home or office walls. You may also block unwanted websites using URLs or blacklisted words or phrases. Along with loads of features, DIR-615 showed up reasonably good performance as far as networking is concerned. It reached out at the distance of approximately twenty meters with walls and other obstructions in its way. Despite what D’link says, there is one aspect that you have to take caution of: the ‘N’ mode does not work in a mixed mode environment. This is the only drawback I found out on the device. Priced at US $159, I would call this Router an inexpensive one as compared to its competitors. Looking at the features DIR-615 has to offer, I would say it is very fairly priced. The D-link DIR-615 router is a good option for those wanting to upgrade a basic Wi-Fi G network to the Wi-Fi N standard. The D-link DIR-615 is very easy to configure and use. Overall, we can recommend this device. We give it good points for Wi-Fi N connectivity, good transfer speeds and range, great pricing, and loads of features, with just a few minor drawbacks. A tip: Try using the device without the software wizard. A brief review and verdict for newly launched hardware products and technology gadgets. I try to find hardware that gives full value for money and also scores high in Features and Performance. Overall, it’s a guide for all those people who want to know what to buy, how to buy, and where to buy. Review: Creative Inspire T6060 – Best Affordable 5.1 Surround Speaker System for Your PC?